A 3/4-cup serving offers 3.5 teaspoons of added sugar and less than a gram of fiber. All its nutrients are fortified (the equivalent of eating a bag of Skittles and then popping a multivitamin), sugar is the first ingredient, and the carcinogenic ‘caramel color’ is present. Right. Nothing says “wholesome” like a 3/4- cup serving that delivers zero grams of fiber and as much sugar as three Oreo cookies. Don’t forget the four artificial dyes, hydrogenated coconut oil (unlike unrefined coconut oil, hydrogenated varieties are cardiovascular terrors), and caramel color. For an overview of why food dyes should be avoided, please read this short piece I recently penned. According to this online advertisement, Kellogg’s considers its Pop-Tarts “made for wholesomeness” and points out “they are baked, not fried”. They conveniently forgot to mention that most varieties contain trans fats, artificial dyes (the ‘confetti cake’ flavor packs in 6! ), less than a gram of fiber and at least a tablespoon of added sugar. As is par for the course for these sorts of “foods”, the much-touted “vitamins and minerals” are merely tacked on during processing. “Fun” fact: A single Cookies & Creme Pop-Tart gets 40 percent of its calories from sugar, and contains as much sodium as 28 potato chips. As with “natural” (usually reserved for adult-oriented products), “wholesome” is an absolutely meaningless term food companies love to employ on highly-procssed, minimally-nutrition products. Alas, a sprinkle of vitamins, minerals, or whole grains on otherwise unhealthy foods doesn’t make them “wholesome”, but “just a little less horrible”. Thanks, Andy, for this. It makes me realise again that the best option is to cook for myself and not eat any processed foods. Coconut oil is hydrogenated to increase its melting point even further. This way, it does not degrade or develop rancid odors/flavors during processing. It is a cardiovascular terror because hydrogenating coconut oil results in the formation of trans fats (this is not the case with other fats, which only need partial hydrogenation to form trans fatty acids). Most of the studies “showing” that coconut oil was a “bad fat” were made using hydrogenated coconut oil, not unrefined! I would be curious to see the bio-availability of the vitamins these cereals are fortified with. That is, if anyone is actually capable of reaping any nutritional benefit from their consumption. 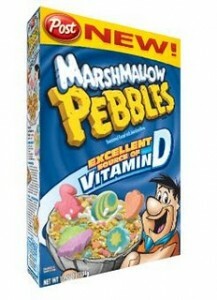 While so far from wholesome my question is whether anyone shopping is buying the fact that Pebbles are good for you. Sure, they may not know how bad (as you explained) but pop tarts healthy? Do these companies sit around and say “ok we have total junk here, what wording can we use to confuse people into thinking it’s not so bad? Horrible. Thanks Andy. To Lauren’s point, that’s absolutely how companies operate. Obviously, they’re in it to make and they’ve got to sell it somehow. The real problem is it works. “Wholesome”, “natural”, “made from the simplest ingredients”… So tired of hearing all these weightless phrases from major food companies. The sad part is that people are buying it, both in a literal and figurative sense. This is utterly disgusting. I still cannot believe how much cereal I used to eat growing up. It’s a miracle I didn’t become diabetic from all that sugar I took in every single morning. Not only are the cereals mentioned pumped full of sugar, but they also go through a processing procedure in the factories that basically depletes the products of nutrients. Along with that, there have been studies indicating eating too much cereal can seriously damage a human’s health. To read more about the study, visit http://www.westonaprice.org/modern-foods/dirty-secrets-of-the-food-processing-industry. It’s appalling that our food industry can legally sell us this junk! I recently published a similar post about why consumers should steer clear of processed breakfast cereals all together. Read it at healthfoodisjunk.wordpress.com! Great article and research! It’s refreshing to find others out there who are concerned with the “fake” foods filling up our grocery store shelves. Great piece! Right up my alley. Just shared on my FB page – good job!